The PX2905 RECL SOFA by Vogue Home Furnishings at Furniture Fair - North Carolina in the Jacksonville, Greenville, Goldsboro, New Bern, Rocky Mount, Wilmington NC area. Product availability may vary. Contact us for the most current availability on this product. Made by Vogue Furniture Manufacturing! 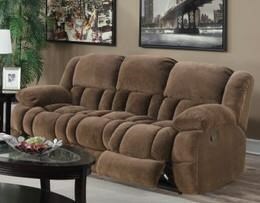 The group features over stuffed seats and backs, along with a chaise pad for leg comfort and support! Recliners are wall away design that only require 3" of space to get a full recline. The PX2905 collection is a great option if you are looking for Tropical furniture in the Jacksonville, Greenville, Goldsboro, New Bern, Rocky Mount, Wilmington NC area. Browse other items in the PX2905 collection from Furniture Fair - North Carolina in the Jacksonville, Greenville, Goldsboro, New Bern, Rocky Mount, Wilmington NC area.